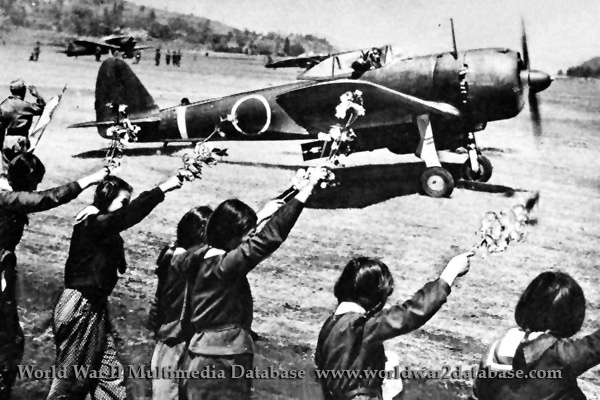 Imperial Japanese Army Second Lieutenant Toshio Anazawa of the 20th Shimpu (Special Attack Unit) Sentai (Squadron), receives cherry blossom send-off from teenagers of Chiran Girls School as he takes off to attack American naval forces off Okinawa as part of Kikusui (swarm) number 2, the second of ten major kamikaze attacks. Cherry blossoms symbolized the Kamikazes. Anazawa is flying a Nakajima Ki-43 Hayabusa (Allied codename "Oscar") fighter with 250-kilogram (551-pound) bombs. Anazawa, age 23 at the time of his death, graduated from Chuo University. Before his death, he wrote to his fiance, "As an engaged man, as a man to go, I would like to say a little to you, a lady before I go. I only wish your happiness. Do not mind the past. You are not to live in the past. Have the courage and forget the past. You are to create a new future. You are to live from moment to moment in reality. Anazawa no longer exists in reality." Many kamikaze were college educated. They received little flight training, only enough to take off and maneuver, not to engage in aerial combat. The Nadeshiko Unit, made up of high school girls, helped with maintenance at the Chiran Air Base, where many kamikaze took off on suicide missions against the American fleet off Okinawa. Chiran also was the residence of Tome Torihama, a mother of two who ministered to the kamikaze pilots in the Tomiya eatery. She smuggled letters home, cooked their last meals, and hugged them goodbye. She led a movement to rehabilitate the reputation of the kamikaze and established a memorial in Chiran. In the two month battle for Okinawa, the Imperial Japanese Army and Navy flew 1,900 kamikaze missions, sinking dozens of allied ships and killing more than five thousand U.S. sailors.